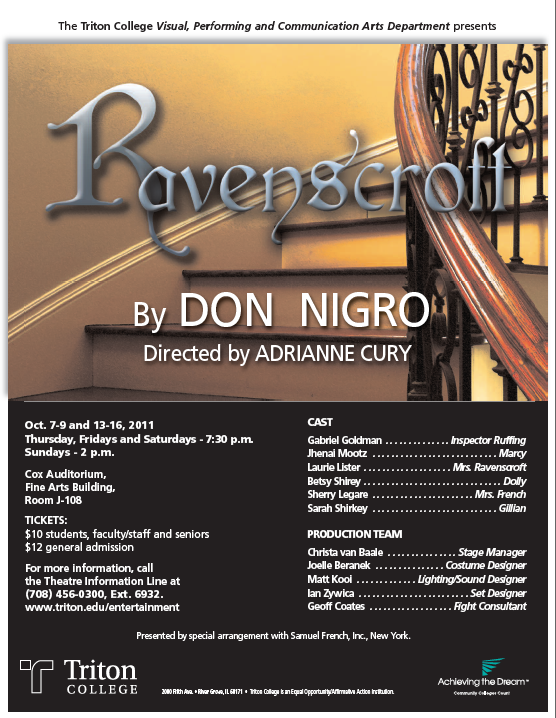 October 13-16: Ravenscroft, A Thinking Person’s Gothic Thriller, A Dark Comedy That is Both Funny and Frightening. Thursday, Fridays and Saturdays – 7:30 p.m.
For more information, call the Theatre Information Line at: (708) 456-0300, Ext. 6932. Director’s Note: I was given a copy of Ravenscroft by a student and as luck would have it, I had just finished reading it when I was offered my first directing job here at Triton College. It had struck me on that first read, I described it glowingly to the artistic director here even though I’d only read it once and never seen it, and it quickly & mysteriously appeared at the top of my suggestion list. Frankly, I thought it would be fun and accessible and would prove -well- simple to climb into. After the many challenges of directing and helping shape new adaptations, I was thrilled by a piece that had actually begun its life as a play. I was soon to discover that was its only ‘simple’ element. It’s described as a psychological drama which is a thinking person’s gothic thriller, a dark comedy that is both funny and frightening. So which is it? Drama or Comedy? Thriller or Mystery or Psycho-drama? The answer to those and many other questions is yes and no, and yes again. To steal from Winston Churchill, it is a riddle wrapped in a mystery inside an enigma. Thus, kudos to Mr. Nigro. I have relished exploring, unwinding, and unearthing all its varied layers with this extraordinary cast, crew and design team but dare not say more for fear of robbing you of its many wonders. Welcome to the world of 1905 in a remote English manor. We are snowed in, surrounded by snow. YOU are the snow. Enjoy the ride.